International Immersion Program is a part of the full time course curriculum after Term-III for students to have an exposure of international business scenario. 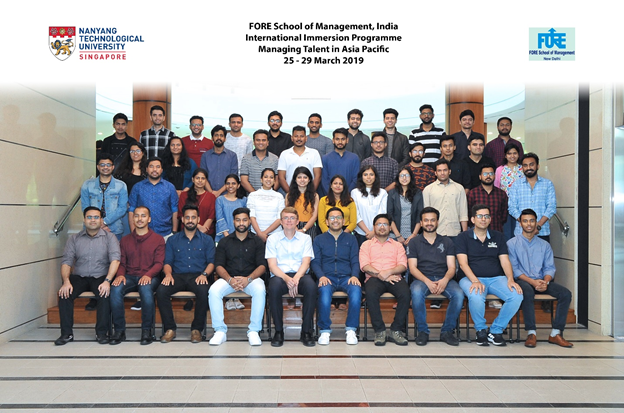 All the full time students at FORE attend one week course at any one of our international partner institutions, including industrial and corporate visits at foreign location. 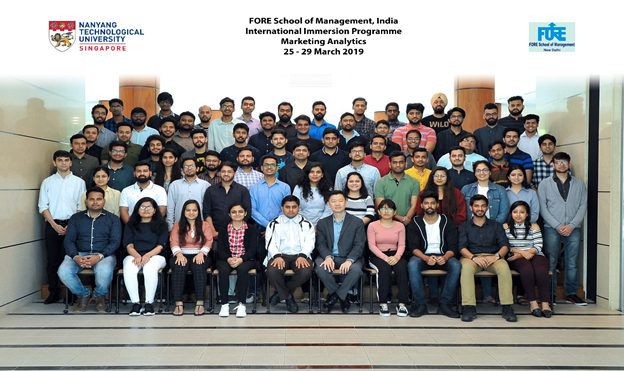 International Immersion Program for the academic year 2018-19 was conducted from March 25 - 30, 2019 at Nanyang Business School, Singapore. Five highly specialized and cutting- edge courses were conducted by NBS, Singapore faculty for our students. The module’s outline was provided in advance to acclimatize the students well. The students were also given pre-reading material and instructions for the installation of the relevant software on their laptop. 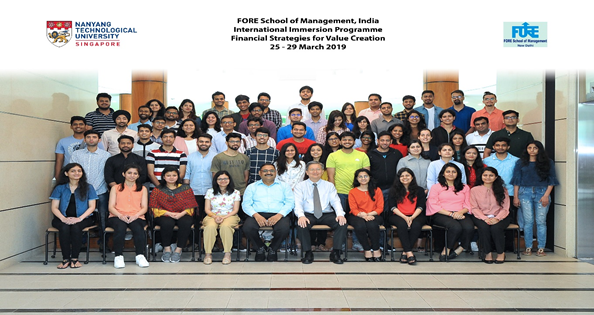 A course on Financial Strategies for Value Creation was conducted by Associate Prof. Low Buen Sin, Associate Dean (China Programme and Executive Programme) and Associate Professor of Banking and Finance at Nanyang Business School, NTU. 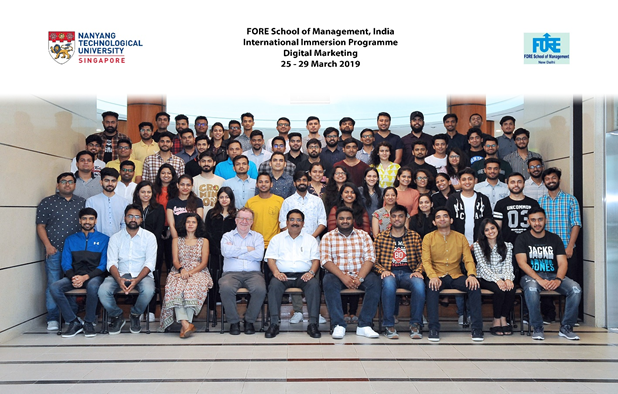 The course broadly covered topics like the value of a company, the financing decision of a company, derivatives, value with respect to mergers and acquisitions, and risk management. Furthermore, an introductory session on China Economy & Financial Markets was conducted by Associate Prof. Chang Xin. Disruption is everywhere and that can be seen in the use of the term across industries and geographies. It is synonymous with change, thinking out of the box, being different, and more. Disruption is actually much more, it is a strategy, a way of thinking. 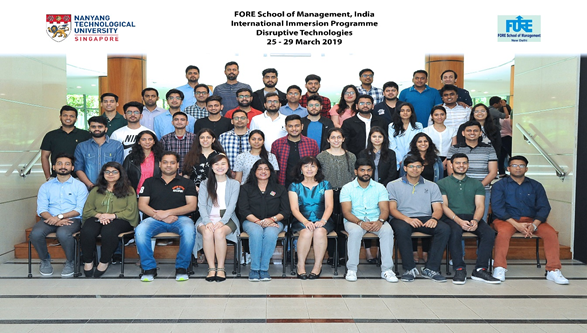 A cutting edge course on Disruptive Technologies was conducted by Prof. Vijay Sethi, Professor ? Department of Information Technology and Operations Management, Nanyang Business School, NTU. This module covers disruption in a comprehensive and holistic way to outline how successful companies have leveraged this strategy for transforming their own, adjoining, and even unrelated industries. Another course on Managing Talent in Asia was conducted by Associate Professor Olexander Chernyshenko. The course broadly covered frameworks important for talent management. Students learned about different ways to think about “talent” and how to find, engage, and retain it to fulfil organizations’ strategic objectives. Several selected talent management theories and models were complemented by relevant case studies and discussions. Each class segment also discussed the talent situation in Asia. A course on Marketing Analytics was offered by Prof. Goh Kim Huat. The course started with the introduction to the “Analytics for Business and Marketing”. It was emphasized that modern organizations have a score of data which can be utilized for various business needs including operations, market planning and research, developing innovative marketing insight and marketing decisions. 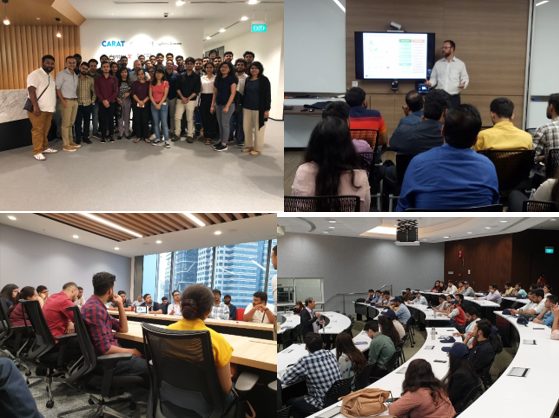 The course introduced students to how to explore the data using various exploratory and visualization tools, doing prediction and explaining them. For this various data modeling techniques were discussed using XLMiner and real business data. In the course, the role of the information part in the business and data has been emphasized and this been explained through various case studies. As an essential part of their academic program, students also visited several companies relevant to their respective specialization courses namely, CXA Group, Asiatic Industries, Holmusk, Societe Generale Bank, Habitat, Dentsu, Merkle, Datarobot, Technology group students also had first hand experience of 3-D Printing at 3-D Printing Lab of NTU. It was fully residential program and throughout the immersion program our students stayed at excellent residential facility of Nanyang Executive Centre, part of NTU, Singapore.